An autonomous robot called 'Mamut' has been unveiled which captures data on crop health and yield at the level of individual plants. By automating data capture, Mamut, unveiled by Cambridge Consultants, gives farmers regular and precise information on their crops, enabling them to predict and optimise yields. Agriculture is under pressure to increase efficiencies, producing greater yields with fewer inputs and less labour. To meet these demands, farmers need precise information on crop growth and health throughout the growing season. Automation of data collection is essential to providing farmers with information at scale. Existing large-scale monitoring approaches use drones, which cannot capture information from beneath the crop canopy. Mamut is an AI-powered autonomous robotic platform. Equipped with an array of sensors, the robot maps and navigates its surroundings without the need for GPS or fixed radio infrastructure. As it travels the rows of a field, cameras capture detailed crop data at the plant level, enabling accurate predictions of yield and crop health. Mamut integrates stereo cameras, LIDAR, an inertial measurement unit (IMU), a compass, wheel odometers and an on-board AI system that fuses the multiple sensor data inputs. This blend of technologies enables Mamut to know where it is and how to navigate through a new environment, in real time. Niall Mottram, Head of Agritech, Cambridge Consultants, said: “Mamut is a practical application of AI, meeting a real and pressing need, particularly for growers of specialty crops where failure carries a high cost. 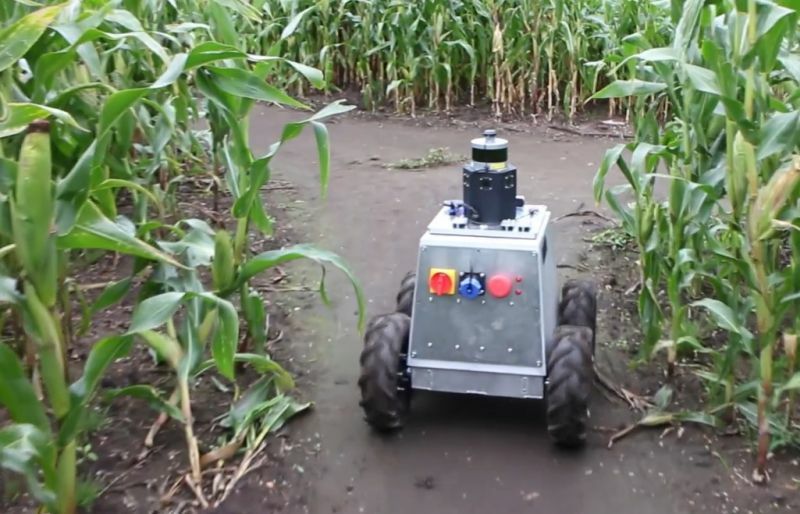 Mamut’s capability to perform simultaneous localisation and mapping, enabling the robot to react and learn from unstructured routes in real time, was developed in navigation trials through the twists and turns of a 12-acre maize maze at Skylark Garden Centre, and at Mackleapple’s orchard, both in Cambridgeshire.